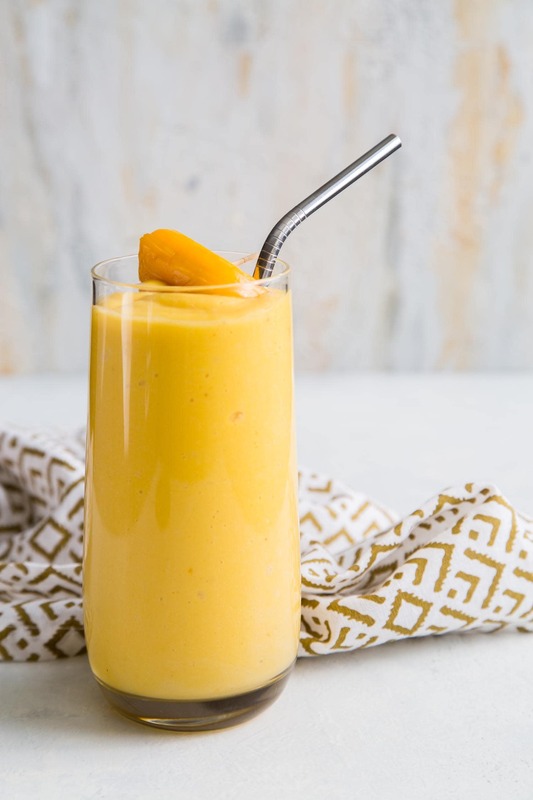 This tropical jackfruit smoothie blends together jackfruit, mango, banana, coconut, and pineapple for a little taste of paradise. My mother-in-law recently bought a ginormous jackfruit. I have a giant stash of fresh sweet jackfruit in my fridge. I’ve been on a jackfruit binge adding the fruit to all sorts of desserts and drinks. 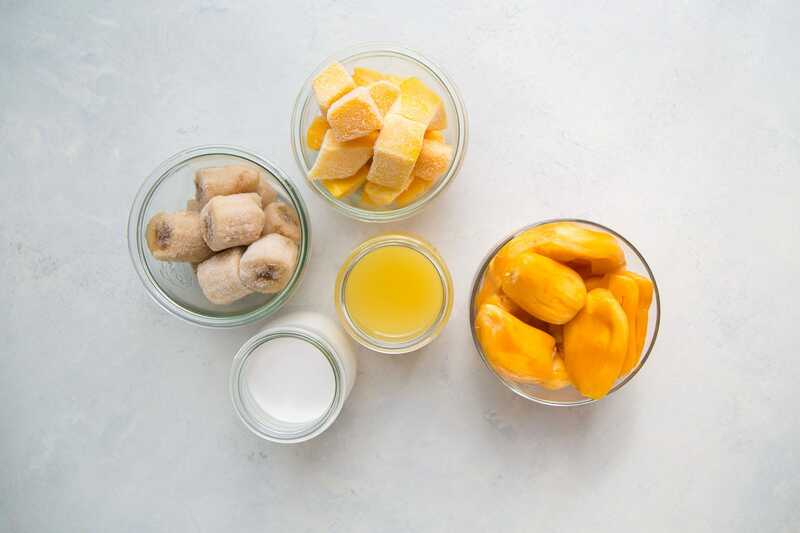 As photographed above (starting at 12 o’clock and going clockwise) you will need: frozen mango chunks, fresh jackfruit (seeds removed), pineapple juice, canned coconut milk, and frozen banana chunks. 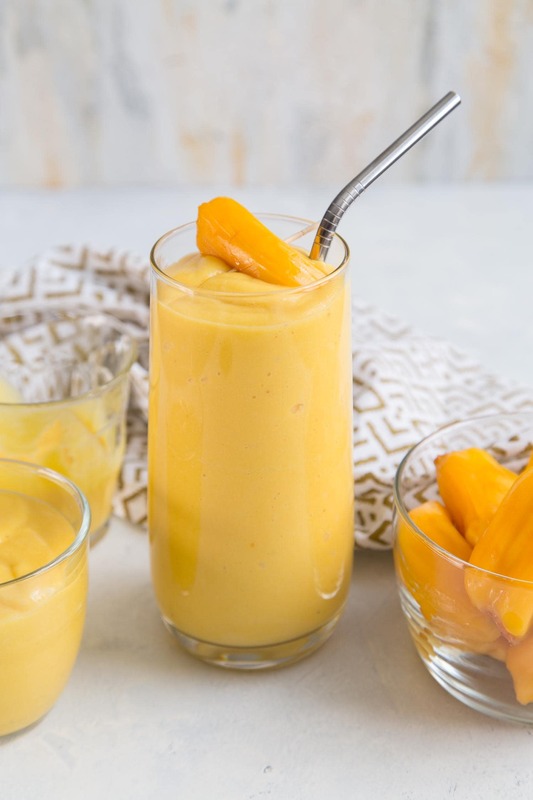 Frozen mango and frozen banana helps to thicken this smoothie. If you substitute in fresh fruits, the smoothie will be a lot looser. Full fat canned coconut milk makes this jackfruit smoothie super rich and creamy. For a lighter version, substitute in light coconut milk or coconut water. If you cannot find fresh jackfruit, canned RIPE jackfruit will work. However, the resulting smoothie will be A LOT sweeter. Canned jackfruit is packaged in a sweet syrup. What’s the difference between ripe jackfruit and young jackfruit? Ripe jackfruit is bright golden yellow in color. The seeded fruit is soft. It is sweet with notes of banana, mango, and cantaloupe mixed into one. Ripe jackfruit is used in many Southeast Asian desserts, like Filipino Turon. Young jackfruit (or unripe jackfruit) is pale yellow-green, almost white in color. Texture wise, it’s a bit tougher. Unripe jackfruit is used in savory dishes. Most recently, it’s become the popular pulled pork substitute in vegan cooking. This can be served for breakfast, as a snack, or as a mocktail option. If you want to booze it up, go ahead and add a shot of rum and turn this into a jackfruit pina colada! Place all ingredients in a blender. Process until smooth. Serve immediately. Fresh banana and mango can also be used in place of frozen. However, resulting smoothie will not be as thick. Coconut milk makes this rich and creamy. You can also substitute in coconut water for a lighter beverage. Want to make this into a cocktail? Add 1 1/2 oz of dark or light rum when blending all the ingredients. It turns into a jackfruit pina colada!